My addiction started at a VERY early age. I had a coop of about 20 birds growing up. My favorite hen wore diapers in the house, rode on the handle bars of my bicycle, and would go to school with me for show and tell. her name was Marla Sandra Chicken. Then, I did a crazy thing. I went to college, got married and had to work. A LOT, and far away - I couldnt have any chickens I didnt have the time for them. Then, I did a smart thing!!!!! I got transfered closer to home! What did i do in April of 2010? 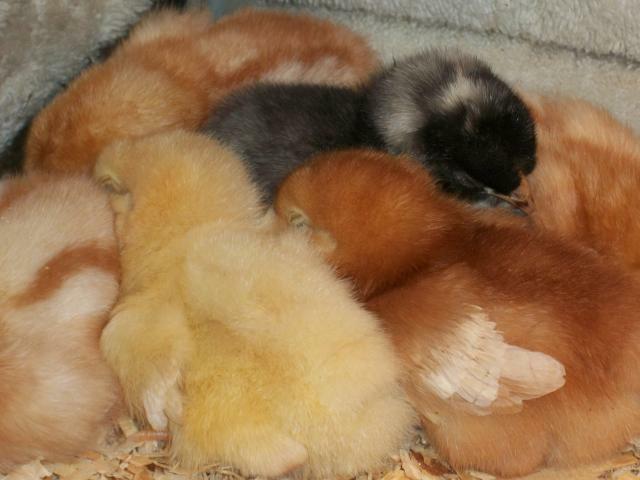 I went and picked up a dozen day old peeps!!!!!!!! no coop yet, just the peeps and me! My husband was surprised. 'holy cow, you were serious?" I will never forget the look on his face. OK, so 2010 wasnt enough? 2011!!!!!!!!!!!!!!!!!!! Spring!!!! here we go again..... here are the new babies bought from Meyers hatchery in April of 2011. Since the start of my flock in 2010, there have been many up's and down's as I am sure we all have. There have been a few rescues and a few deaths since then. 2 of my 5 rescues over the last few years included Elly and MayMay who came to me from the Buffalo NewYork SPCA. I saw their sweet photos on Petfinder and drove the 300 miles round trip to bring them home. How could I not? This is MayMay. I lost her in October of 2012 and it broke my heart. The wierd thing is that the day MayMay passed away in my arms, I had taken in another little girl that I named Hope. I had pullled her off a farm where she was on deaths bed. No feathers, and days away from death. As I sat with MayMay on the floor of the coop holding her as she passed, Hope was sitting in my house in a cage waiting to be cared for. She is doing very well as of February 2013! Her feathers are coming in slowly, but surely. In the summer of 2012 I also brought into the flock Maggie and Midge. They were owned by a nice couple in the city that could not care for them anymore. They are White Rocks and are good girls! They were never abused, but had never seen grass or warmth. They has spent the first winter of their lives living in a tiny rabbit hutch with no shelter from the elements. Their owners didnt know any better. I can't believe they made it through the Ohio winter! Maggie on the way home. In 2013 'Bird has continued to be the claim to fame 'ham' that he has always been. He went to see Santa this last Christmas! He's still my 'Big Guy!!!!" I luv him to death!!!!! 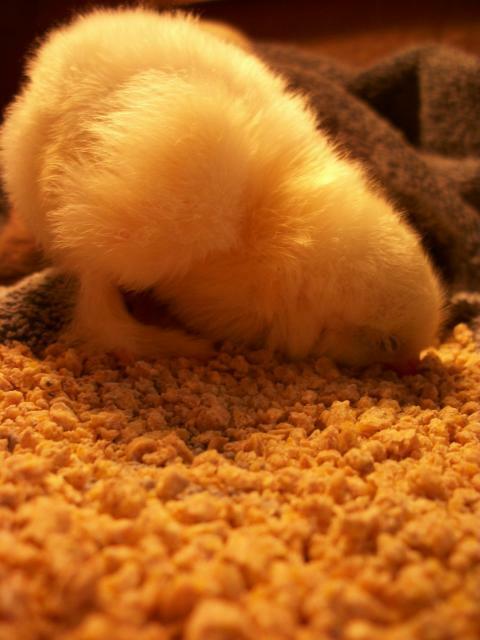 He went to work with me and met all of the new science teachers who would be hatching chicks with their classrooms! This year, I said I was done, going to have a smooth sailing summer. Well, it DIDNT happen adn it's only February!!!! 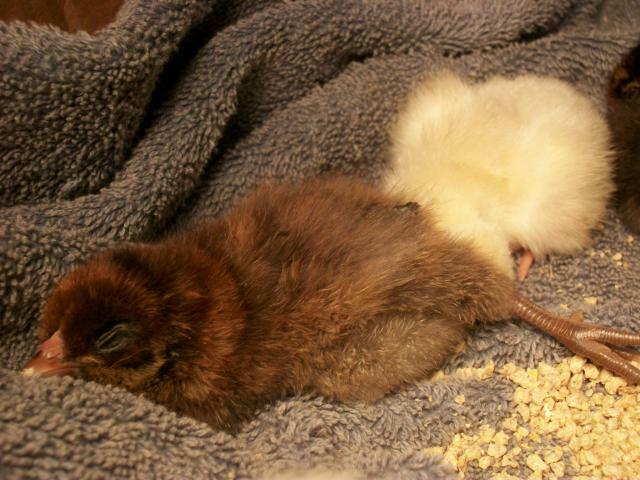 Here are my 6 new babies born on February 4,2013. This is Victoria a Whtie Sultan. She is the center of attention right now. Such a luv button!!!! 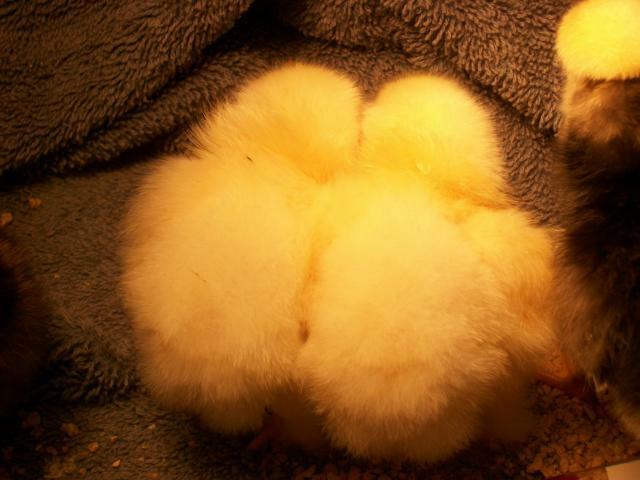 So you want to rescue a chicken... Now what? 'Bird and the Fluffy Butts Hut.